Located in the Oak Ridge section of Jefferson Township in Morris County, this unique ranch style home offers the convenience of one-level living. The main living area is open and bright with, not only radiant flooring, but also a wood burning stove to further save on fuel costs. This home offers 3 bedrooms and 1 full bathroom (recently updated), a spacious foyer/sitting area with gas fireplace, laundry room, living room, country kitchen and a fantastic outdoor covered custom bar, with a long list of unique features. There’s a large walk-up attic for storage and a one-car garage. The driveway offers parking for at least 8 vehicles so invite all the guests you want! The yard is a park-like .93 acres that backs to a wooded buffer for complete privacy, and a fenced-in dog run for your fur family. For more information on this special home, contact Antoinette Scognamiglio, Sales Associate, Coldwell Banker Realtors at 201-240-8699 or submit your information and questions below for a prompt response..
Everyone wants to be hip, and the latest trends in design can help distinguish one home from another. And it’s not all flash; many new home fads are geared to pare maintenance and energy use and deliver information faster. Here’s a look at what’s coming. Moving is generally an awful experience. It’s a crazy process with a seemingly infinite to-do list that is only made remotely easy by hiring a moving crew. But that chaotic list exponentially grows when mixing toddlers and grade school children into the mix, and even small dilemmas can grow into huge headaches. Small kids live their lives through perennial stability introduced by their environment and guardians; once those factors change their emotional state and behavior change as well. But it doesn’t have to be too much of a headache. By following a few simple tips, whether you’re moving into a new home in the same town, or across the country, the kids won’t be too much of a struggle and will hopefully have an easier time adjusting to their new home. These tips are time intensive, so be sure to give yourself plenty of time so you’re not rushing and sending negative vibes to your child, which would only make things worse. Children need to be the center of attention. The world truly does revolve around them in their minds. If this isn’t respected, they’re almost guaranteed to become rambunctious. And when you’re moving there are too many things going on to pay constant attention to your child’s whimsy. But by explaining what moving really means and including them in the process they’ll likely settle down. The first thing to do is explain, as simply and thoroughly as possible, what moving means and what the process will entail. Be sure to answer any questions they may have honestly, and try to remain positive when they begin to object. Let them know that the move is happening in no uncertain terms, but make them think their input matters. One way of letting your kid think they’re helping and that their input matters is to ask them to pack their own belongs like books, toys and clothes alongside you. This process is fairly simple and it will give them a deeper connection to the moving process. Sure, you’re more than likely going to need to repack everything they do, but making sure they’re comfortable is important to keeping their mental state healthy, and their tantrums silent. If you think your child might have trouble adjusting to the idea of leaving the old house and embracing the new one, which many do at some point in the process, give them a shoe box and ask them to fill it with things they can directly relate to the previous location. Whether it’s a small rock collection, some sticks from a nearby tree or even a picture of the house or their friends, having these items will help them feel comfortable during the adjustment period. Once you’ve arrived at the new house, strongly think about getting at least part of the kids’ room put together first before starting to work on the rest of the house. It may be a hassle upfront, but it will allow them to have a place of their own to stay in, and it will keep them out of your hair while you set everything up. The time dedication it takes getting a new home comfortable and in living shape requires, you’ll likely be more distracted than usual. Depending on the severity of this, your kid might feel forgotten or neglected. Be sure to remind them that they’re the center of your life. If your child had friends at the previous location they’re bound to be lonely soon after moving. Remind them that new friends will arrive, and discuss some of the new, exciting activities your family can now do. Go out and explore the new city, and give them input on where to go. Finally, when your child does eventually start school it’s a good idea to tag along and meet all of their teachers. Try to do so before classes begin, so it gives you time to discuss any pressing matters without embarrassing your kid in front of their new peers. Remember to set realistic expectations for the moving process. You, nor your child, are going to adjust perfectly. Every move has its hiccups. Let them come, and deal with them as they arrive. Buyer Rebates At Closing & Seller Reduction In Commission…REAP the Benefits! The Real Estate Assistance Program (REAP) allows Coldwell Banker Residential Brokerage to offer employees/members of participating companies and organizations a 10% commission reduction for sellers or 10% rebate to buyers at closing on any Real Estate (non-rental) transaction in New Jersey. In most states a comparable program is available, so, if say, you were purchasing a second home in another state, as an employee at a participating company or organization you could receive this rebate as well. The list of participants are varied and ANY SIZE COMPANY can join! Todate, we have currently enrolled: Amwell Valley Trail Association, Bridgewater Chevrolet, Bristol Myer Squibb, Center Court Athletic Club, Garden Savings Federal Credit Union, Montclair State University, Nyack Hospital, Route 3 Honda, Route 46 Chevrolet, Rutgers University, Somerville Lumber, William Paterson University, York-Jersey Underwriters, among others. Even municipalities can join. At this point Bernards Township in Somerset County is enrolled so their firemen, police, council members, teachers benefit from the program should they decide to sell or purchase real estate. Where does this 10% commission reduction or 10% rebate come from? Participating agents agree to pay out a 30% referral fee to Coldwell Banker. The credit or rebate to the client is paid out of that 30% referral fee. employees or members can join. These benefits can only legally be offered through this program and is not available to the general public. Interested yet? If you would like more information about this program and how to your company can enroll, contact me at AntoinettesellsNJ@gmail.com and I’ll be happy to assist in facilitating your membership. Disclaimers: 1) It is recommended that the buyer consult a tax advisor regarding the consequences of rebate; 2) The purchaser may pay taxes on rebate if any apply; 3) The agreement to rebate must be signed by buyer at the time of agency relationship with Coldwell Banker; 4) Limited to residential property; 5) Rebates are limited to purchasers. The Real Estate Assistance Program is a free, no-obligation benefits program offered in all states through Coldwell Banker Residential Brokerage. The ability to offer a rebate may be modified or prohibited in some states. OFFERED AT $348,500! Get ready to be impressed! This spacious 2 Bedroom, 2.1 Bath multi-floor townhome is move-in ready and ideally located just steps from the Development Clubhouse, gym and pool! Extremely popular and sought after, the Londonderry model is the second largest unit and offers 2,194 square feet! Begin your love affair as you step into the sunny foyer accented by large picture window and rustic chandelier. 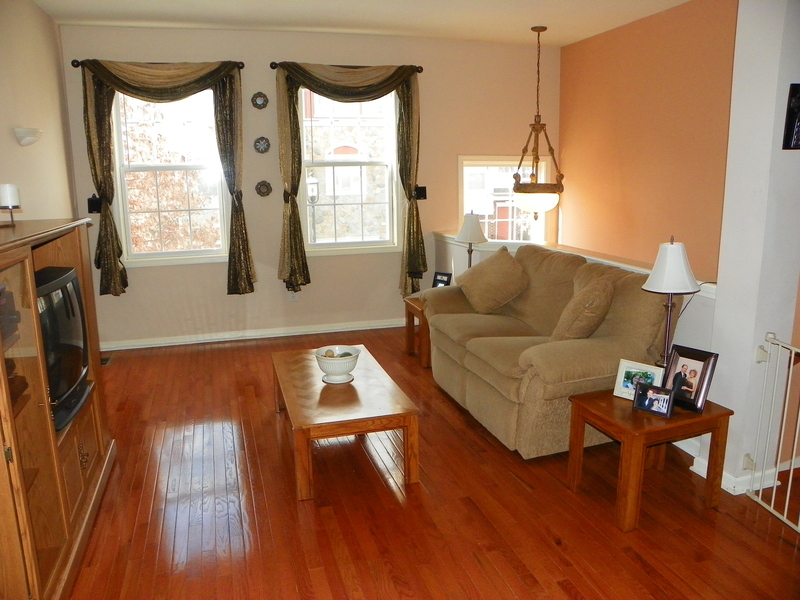 The living room boasts gleaming hardwood floors which span throughout the sun-drenched main living area. The dining area with sliders to a brand new deck with privacy divider can accommodate a holiday crowd or informal gathering. 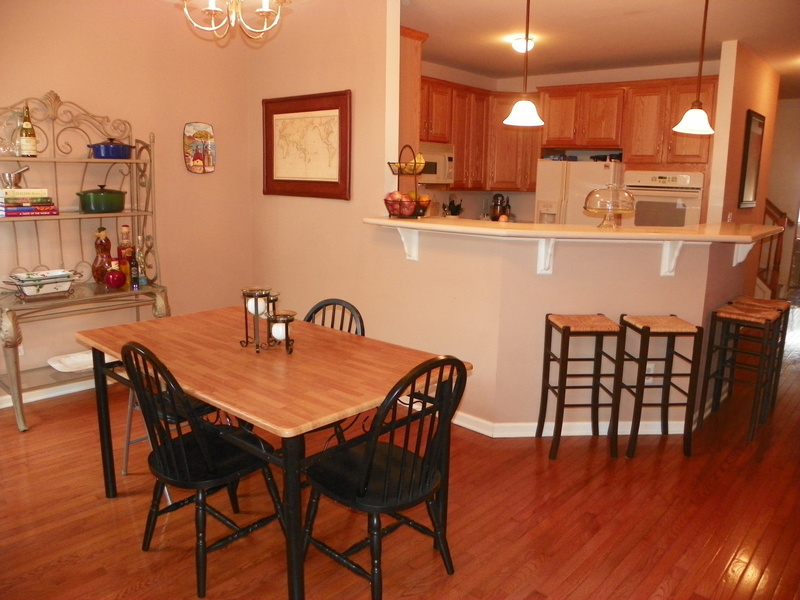 The kitchen offers roomy 42” oak cabinets, expansive Corian® counters, beautiful ceramic tile floor and breakfast bar. 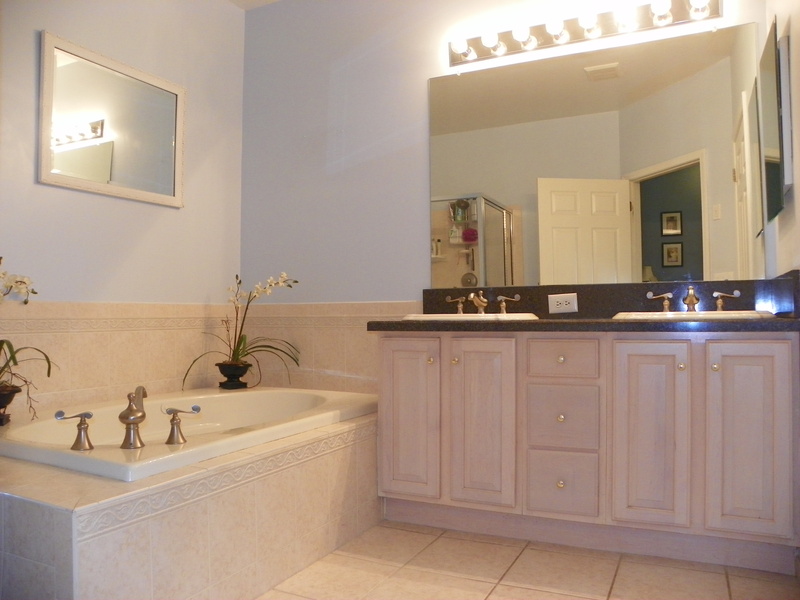 A powder room is conveniently located on the main level as well. The family room on the ground level is generously sized and features a gas fireplace and walk-out access to the brand new cement patio. A cozy office is currently being used for storage. There’s direct access from the one car garage into the ground floor living area. 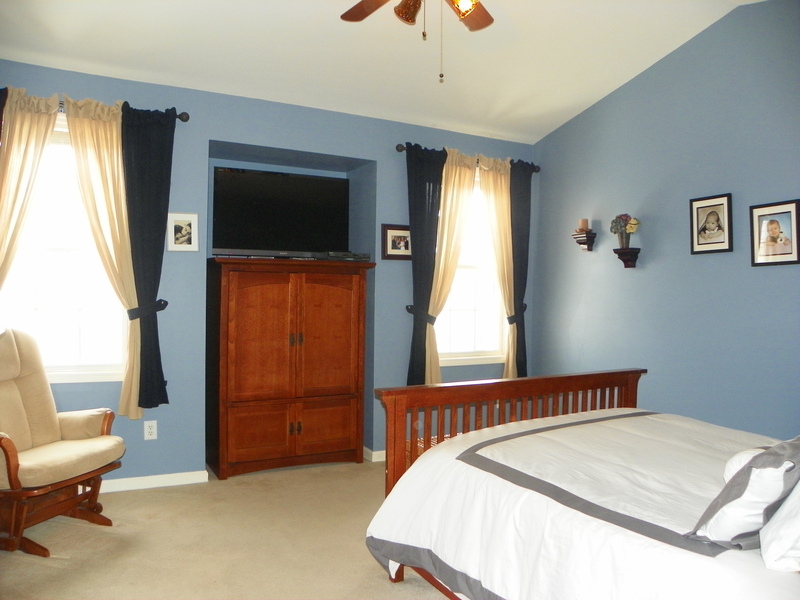 Upstairs, the master bedroom is a serene retreat with a large walk-in closet outfitted with California Closet system, another double closet and stunning private master bathroom. The master bath is gorgeous with neutral tile, luxurious jetted tub, double sink vanity with Kohler fixtures, stall shower and doored commode. The secondary bedroom is also a great size, with a fantastic double window adding to the cheerful demeanor of this space. Double closet for ample storage. The guest bathroom is pristine with ceramic tile and a Corian® topped oak vanity. The laundry room is conveniently located on the second floor and the washer/dryer are included in the sale of this fabulous home. 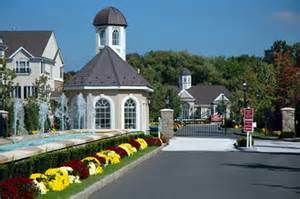 Cambridge Crossings is an impressive gated community, which is located just off of Routes 3 and 46, as well as minutes from the Garden State Parkway, Cambridge Crossings is one of the most commuter friendly and attractive developments in the area. It is an exceptionally safe development with guards on duty Sunday through Thursday, 7 am until 8 pm and Friday through Saturday. 7 am until midnight. The call box system is in force when the guards are off duty. There is also an on-sight property manager stationed in the Clubhouse from 9 am – 5 pm. With safety as a top priority for the residents, you can enjoy the luxury of a 24 hour guard gate at the Colfax Avenue entrance. The clubhouse, centrally located in the development is equipped with a fitness room, locker rooms, and a very large common area with an outside 1100 square foot deck overlooking tranquil natural landscape. Just outside the clubhouse is the crystal blue and refreshing swimming pool for summer relaxation and fun. During the hours of operation there is a lifeguard on duty. Located about 1/3 of a mile up Colfax Ave is the Clifton train station (Main Line) where you can take the NJ Transit train and to Manhattan via Secaucus transfer. If you prefer travelling by bus, the stop for the Express bus to Manhattan is right at the Cambridge Crossings Gate! Don’t miss this rare opportunity to buy into this great community and this wonderful home! Contact me at AntoinetteSellsNJ@gmail.com or cell 201-240-8699, for more details on this home and to schedule an appointment. If you’re still comparison shopping, you can search all available listings on my website. I’d be happy to answer any real estate questions you might have! Are You An Informed Buyer? As a first time homebuyer or someone who hasn’t purchased a home in quite some time, embarking on your search is exciting and fun but can also be fraught with anxiety when facing unknown or unfamiliar territory! Your best defense is to become an INFORMED BUYER; not only of what properties are on the market but also of the home-buying process itself. These seven guidelines will hopefully remove the trauma from buying your next home and help to make your search and ultimate transaction a smooth process. 1. Assess and Monitor Your Financial Situation As soon as you suspect you may be in the market for purchasing your next home, obtain your credit scores and determine any ‘weak links’ or discrepancies. If you’re renting, start collecting proof of rent submitted as many if not every lender or mortgage broker will request this information. Also, it’s important at least six months before you intend to file for a mortgage, to NOT make any large purchases, be that a car, motorcycle, furniture, etc. Any large purchases can affect your debt-to-income ratio which will jeopardize your ability to qualify for a mortgage. Speak to a mortgage broker to determine what products you may qualify for. 2. Obtain a Pre-Approval for a MortgageAfter you’ve watched your dollars and cents, the next thing you should establish is a budget based on your income. Once you’ve determined a price point, it’s imperative to speak to a mortgage broker to obtain a pre-approval letter. This primary step will save you hours of time and potential aggravation by simply verifying how much house you’re qualified to purchase. Why look at $800,000 homes when you can realistically afford a $600,000 home? A pre-approval letter is also ALWAYS included with the offer to purchase. Most listing agents will do their utmost to ensure that any potential buyer is qualified to purchase their client’s home, and no seller will consider your offer unless it’s accompanied by a pre-approval letter. It’s also important for you to know that obtaining a pre-approval letter will NOT affect your credit standing when solicited from a reputable mortgage lender. The search for the perfect home often begins without an exact idea of what you want, but it’s important to know what features are most important to you. I suggest you make a wish list, the “must haves” and the “nice to have” list. I’ve broken this down into 4 categories. Answering these questions can help you narrow down the search and remove that overwhelming feeling you may get with house hunting. Location – The saying “LOCATION, LOCATION, LOCATION” resonates for its accuracy. There are two main things that need to be considered a) Community (i.e. 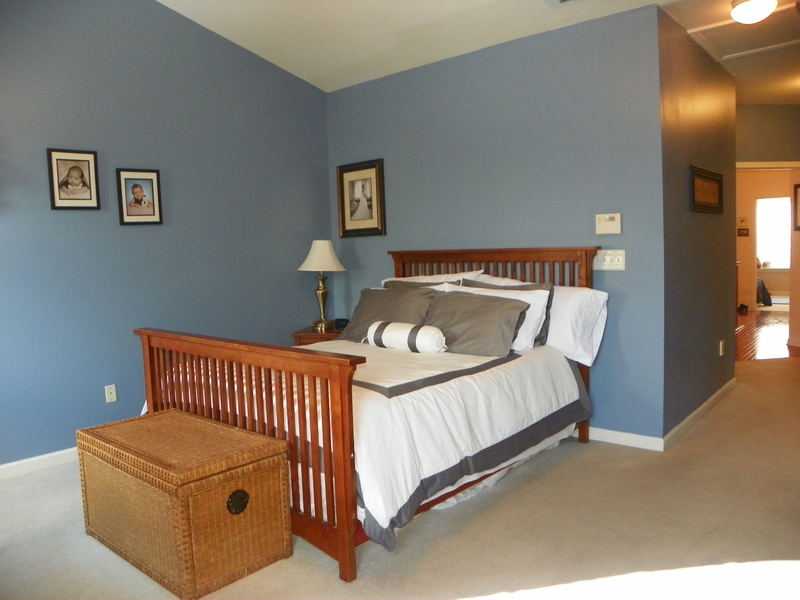 school system, town center) and b) the commute to your place of employment. Features – Number of bedrooms, bathrooms, gourmet kitchen, garage size, lot size. Once you have made your wish list you need to choose a Realtor® that knows the area and is willing to do the “legwork” for you. Your Realtor® should provide you with a copy of a Consumer Information Statement and explain to you how the various relationships work. It’s always a good idea to ask for references for your Realtor®. You want to ensure you’re working with someone that not only knows the area but also understands and listens to your needs. You will probably want to see the home of choice at LEAST twice before making an offer. Some buyers feel more comfortable after showing a home to a trusted family member or friend. This is not unusual, so if another opinion puts you more at ease, go for it! Making an offer can be fraught with anxiety but your Realtor® should provide you with a Comparative Market Analysis of the home and confirm that your offer is in line with the current market value. Offers are made in writing and are always accompanied by a pre-approval letter, as mentioned previously, and an earnest money deposit (usually $1,000). Your deposit is kept in a non-interest bearing trust account of either your agent’s broker or your attorney. If you and the seller move forward to sign a contract, this amount will be applied towards your down payment. If a contract is not agreed upon, the deposit is returned to you. Once all parties have agreed on the price and terms of the contract, it will be submitted to each party’s attorney by the real estate agents involved. Once submitted, the attorneys have 3 business days to acknowledge receipt and respond. Although attorney review usually runs for three days, it may be concluded sooner or slightly thereafter. If you don’t have an attorney who specializes in real estate, your Realtor® should have inquired about this already and would have provided you with a list of real estate attorneys to contact. There are several items that will be listed in the contract and need to be competed in order to complete the contract. Closing Date – This is the intended date that the buyer will take title of their new home. Mortgage Contingency – The buyer undertakes to obtain a mortgage within a specified time. If unable to get the mortgage, the contract is then null and void. Inspections – Certain inspections are necessary and will be required by the mortgage company (well, septic and termite). Any findings from an inspection that concern you will be handled by the attorney via a written request to the seller’s attorney and repair costs, etc. can be negotiated between the buyer and seller. Further Deposit – Based on the size of the mortgage you have negotiated, the contract will specify the amount of down payment you’re submitting and the due date. Closing Costs – A conservative estimate of closing cost is approximately 3% of the purchase price, which is on the higher side but it’s better to have more monies in reserve for required costs than to be caught short! Once attorney review and inspection concerns are resolved, there are several other items that must be expedited prior to closing on your home. Your attorney will address a title search and survey. Your mortgage company will require you to obtain Home Owners insurance. You’ll have to open/transfer utilities, cable, water, sewer garbage, etc. Your Realtor® will be able to provide you will all the relevant contact information for these utility companies. Lastly, a final “walk through” on the house is performed, usually occurring the evening before or several hours before closing. If there are any potential issues found, contact your attorney so these can be addressed before closing. You’ll take possession of the keys, garage door openers, etc., at the closing. If you’re purchasing a condo, townhome or any property that requires a mailbox key, make sure that key is included as well! Knowledge of the home buying process will go a long way to easing the anxiety of making your largest purchase! Enjoy the experience of owning your new home! Hi, I’m “Antoinette” Scognamiglio (licensed as Maria) and I strive to meet the needs of buyers and sellers with a “no surprises” approach towards a closed transaction. Based in Morris County, I also cover Bergen, Passaic, Essex and Sussex Counties. I’ll “go the extra mile” to service my clients, take them through a successful transaction and help them to move on to the next phase of their lives. Please visit my website at http://www.AntoinettesHomes.net for more information and client testimonials.